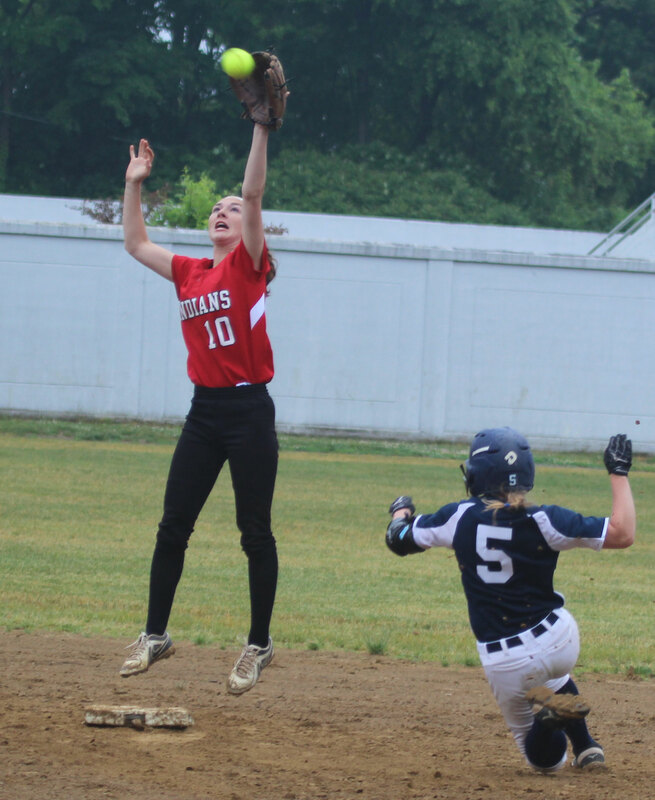 Senior 2B Lauren Fedorchak leaps for a throw as Abby Duggan slides. (Amesbury MA) The Amesbury Indians took down Mt. Alvernia, 9-2, on a drizzly Sunday afternoon to reach the quarterfinals in D3 North softball. The Mustangs (13-7) came in with three straight shutouts, including a 12-0 win over Cathedral in the D3 North preliminary round. That trio of consecutive shutouts ended quickly as sophomore Caity Baker (three hits/two rbi) delivered a two-run homer to left in the first inning at fence-less Perry Field. 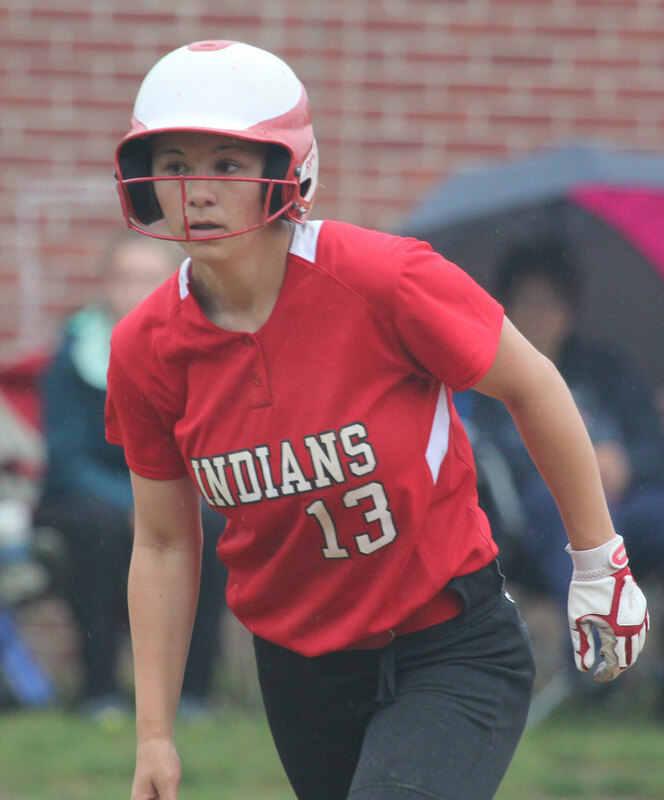 The Indians (17-4) were back with another two-run dinger (Adrienne Harris) in the third inning after gathering three runs in the second inning. Adrienne’s shot also sailed over the leftfielder’s head and rolled forever. Both AHS homers would probably have cleared fences. The Mustangs had eight hits off AHS pitcher Haley Catania but only in the one-run seventh did they put more than one hit together. And also, only one of those hits (triple) was for extra bases. 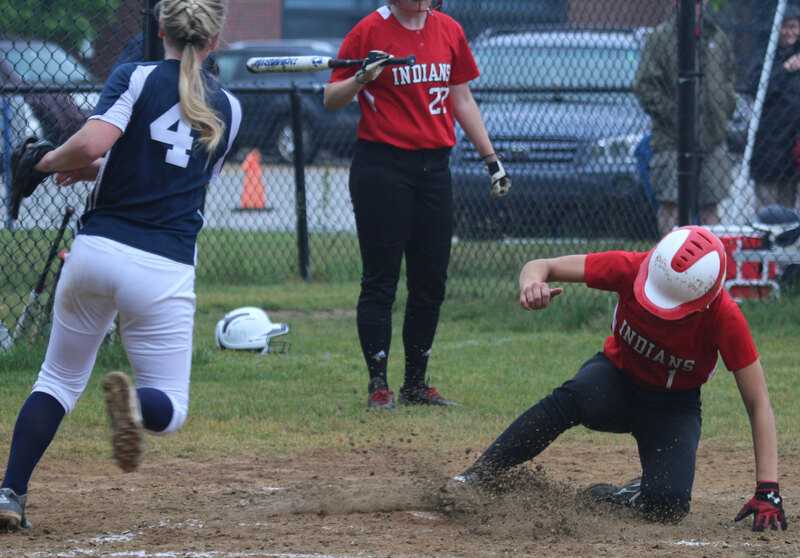 On the other hand, Amesbury had five extra-base hits and multiple hits in the first four innings and scored in each of those innings. This afternoon featured an Amesbury defense that was error free. 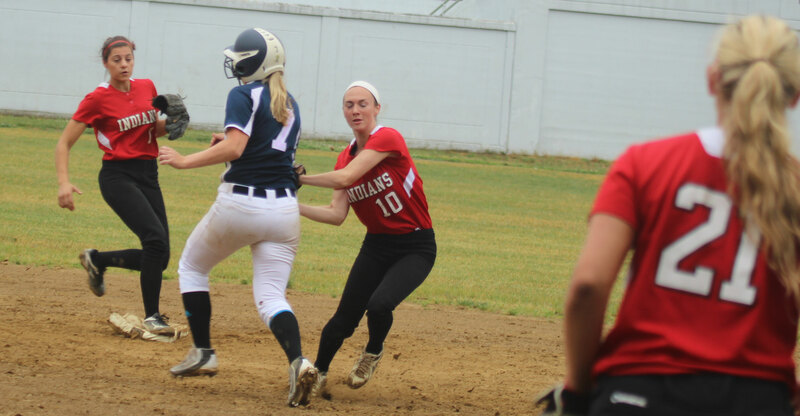 Second baseman Lauren Fedorchak started 4-3 double plays in the sixth and seventh innings. Down 8-1 in the fifth inning, the Mustangs wrecked a promising inning by running into two outs on the base paths. 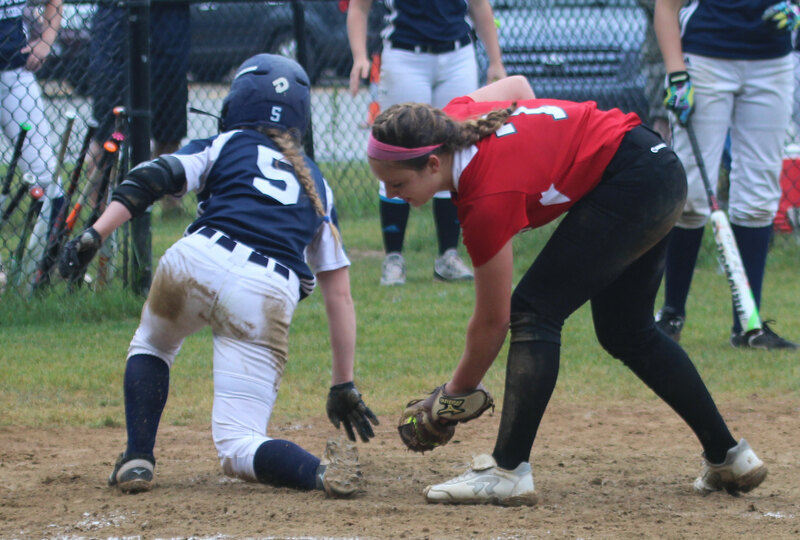 Abby Duggan broke for third on a grounder back to Haley Catania. Haley looked toward first and then alertly tossed instead to 3B Adrienne Harris who had Abby by a lot. 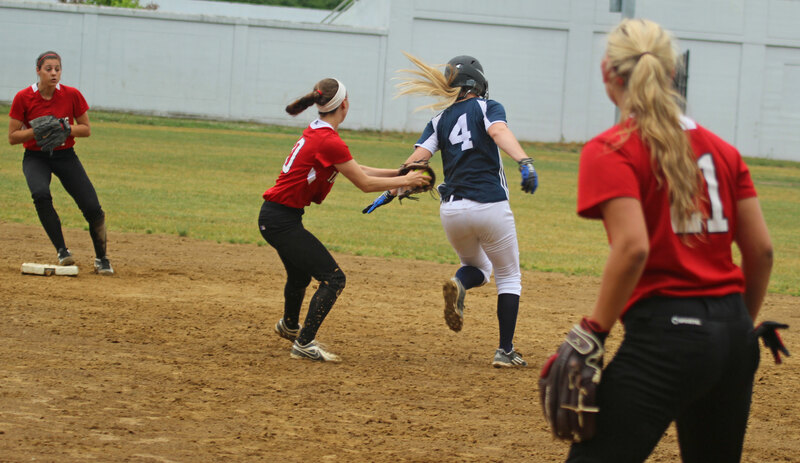 Later in the inning Maeve Moynihan was tagged out by shortstop Maddie Napoli trying to steal. That tag-out by Maddie on the attempted steal was quite remarkable. 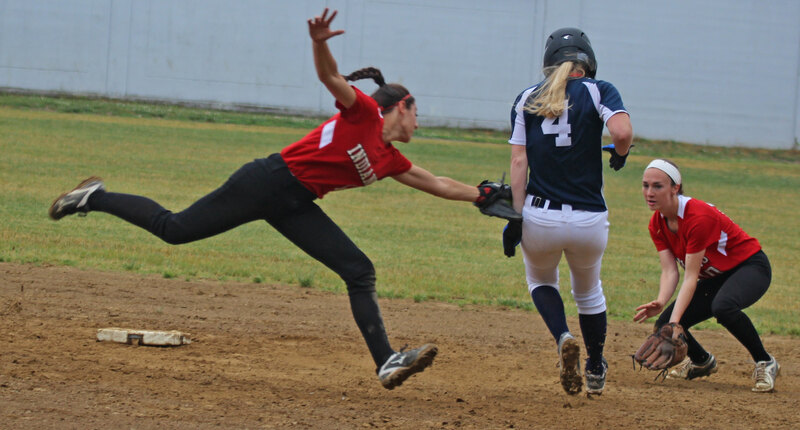 The Player-of-the-Year in the Cape Ann League Kinney Division appeared to intercept the throw from catcher Caity Baker to 2B Lauren Fedorchak and then lunged to apply the tag. Very athletic move! 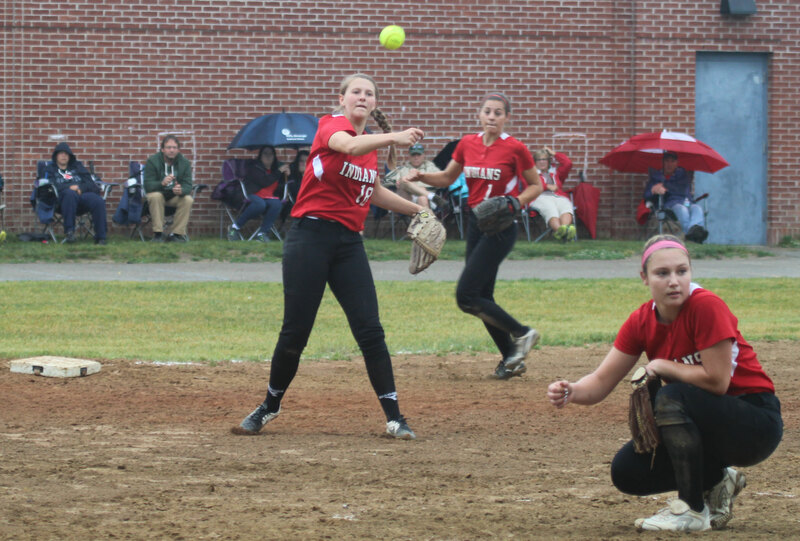 Five wild pitches allowed Amesbury to put up three runs in the second inning. A wild pitch put Adrienne Harris in scoring position after a walk and she scored on Haley Catania’s RBI double. A wild pitch moved Haley to third and she scored when Maddie Napoli singled to center. Maddie got to third on wild pitches and later scored the third run of the inning after yet another backstop ball. 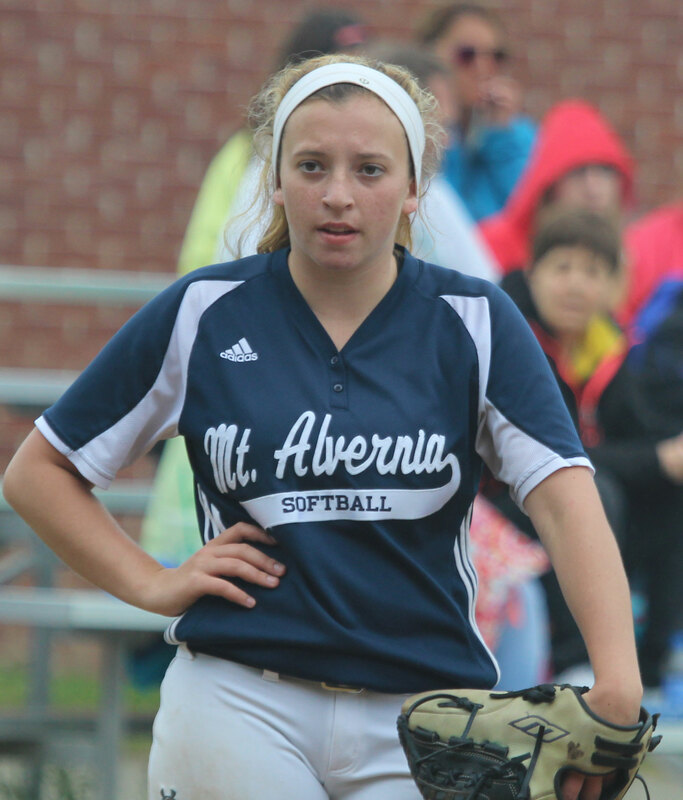 Abby Duggan created the first Mount Alvernia run in the third inning. 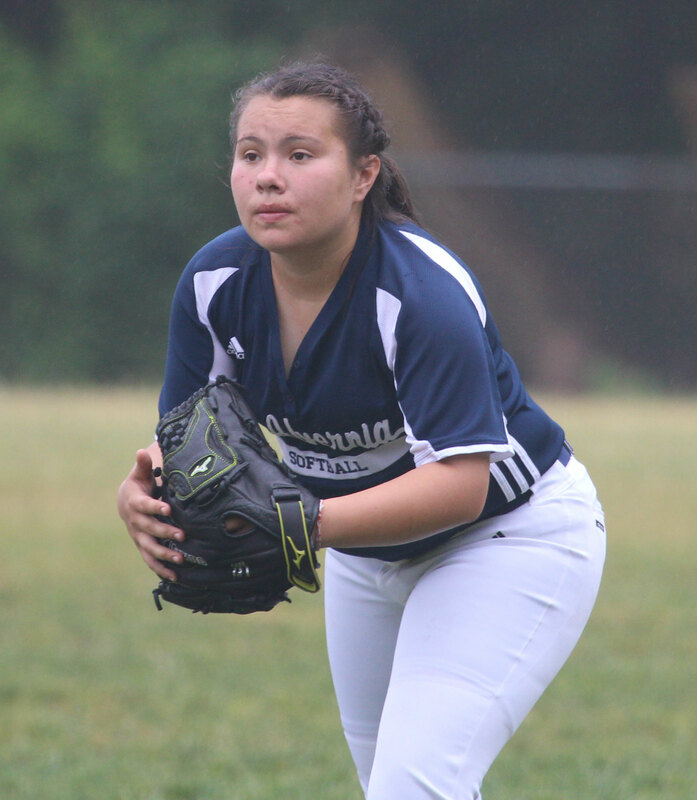 The speedy junior singled, stole second, and reached third on a fielder’s choice. She scampered home on a wild pitch. Amesbury added solo runs in the 4th and 6th. 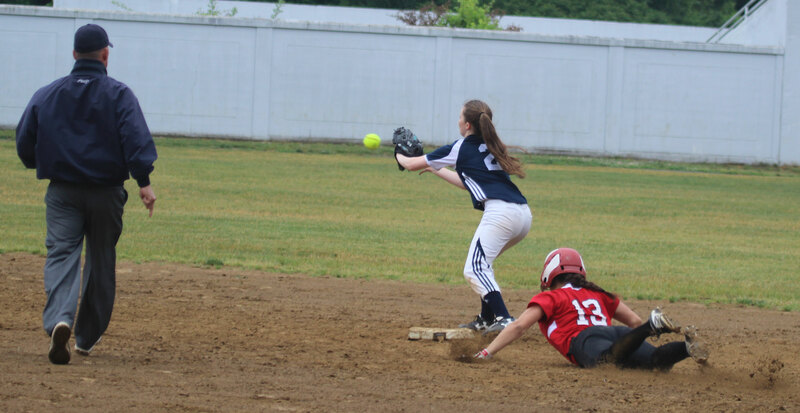 In the fourth, a hustle double by Caity Baker (head-first slide into second) produced a run after Megan Reid followed with a triple to right center. 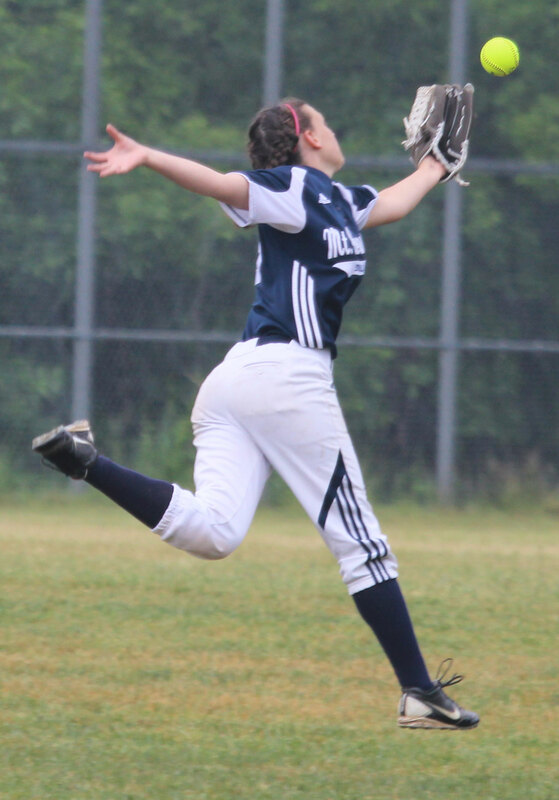 The Mustangs’ centerfielder (Kaley Moran) nearly made a highlight-reel snag of Megan’s shot. 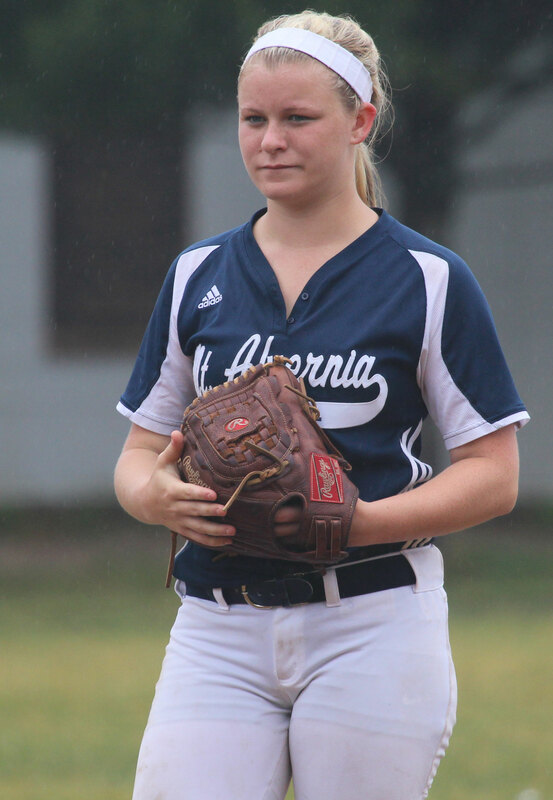 AHS could have had another run but Megan chose to stay at third when a two-out infield popup was dropped by the pitcher. In the sixth, alert base-running paid off for the Indians. 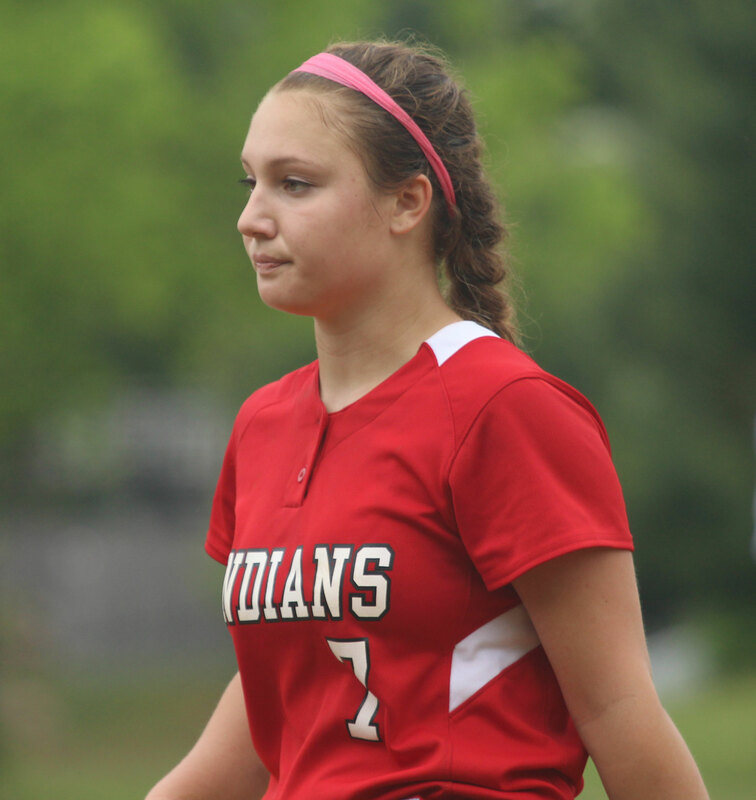 After Caity Baker singled and Megan Reid walked, Caity raced to third after a pickoff toss to first. 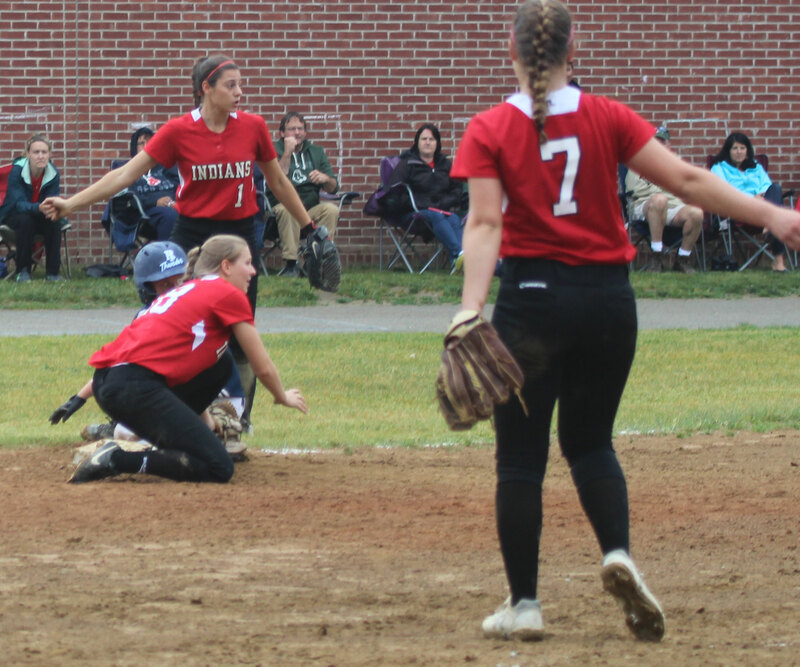 Later, Megan stole second by sliding in and dislodging the tag attempt enough that Caity had time to slip home with the 9th AHS run. 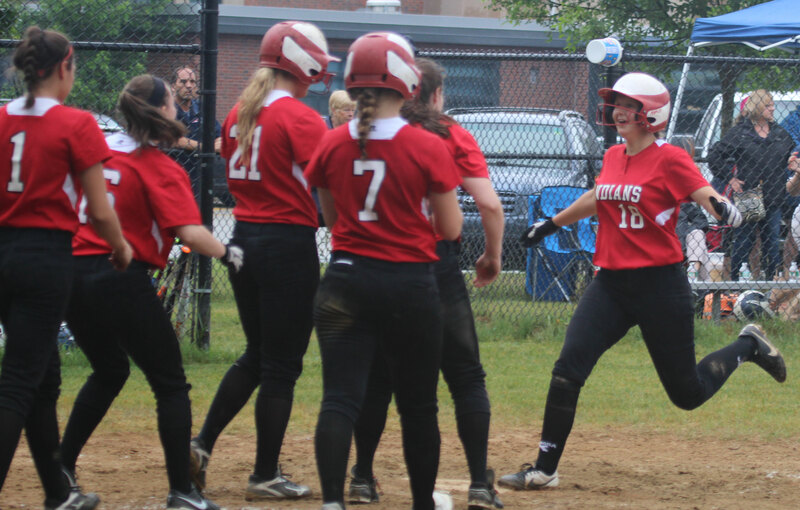 Amesbury’s 9-1 lead going into the top of the seventh got a bit tenuous after a triple (Una Gavin) and a one-out RBI by freshman Alyssa Newton. The next two batters reached, loading the bases with one out. 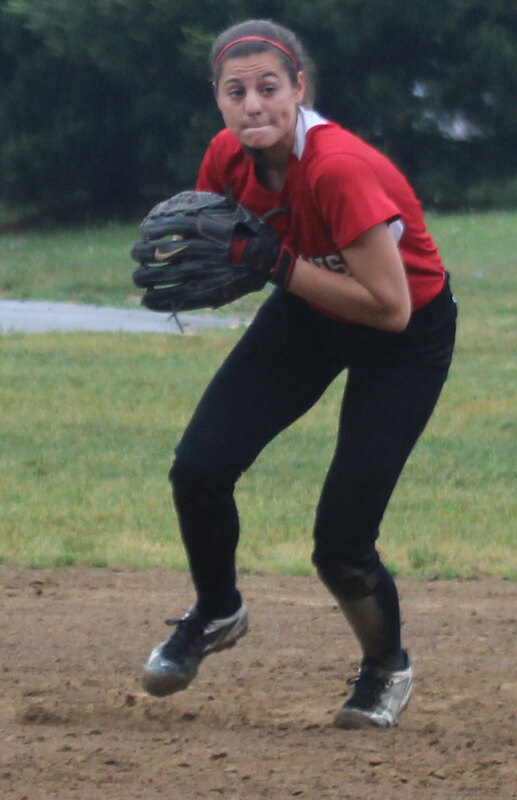 But senior Lauren Fedorchak started her second 4-3 double play to end the game. Maeve Moynihan, Abby Duggan, and Una Gavin each had two hits for MA. Mount Alvernia was 14-4 in 2015 and reached the D3 North quarterfinals. I arrived late to the game after expecting it might be called off by the rainy forecast. Some games were called off. However, with the Mustangs traveling from Newton any postponement needed to happen hours earlier. The Indians will take on #4 seed St. Mary’s on Wednesday night at Breed Middle School in Lynn in the D3 North quarterfinals. The #5 seed Indians may regret those two losses to powerhouse D1 Concord-Carlisle this season because they might have avoided St. Mary’s this early and their second game in the tournament probably would have been in Amesbury. But playing tough competition such as CC during the season can help prepare a team for the tourney. I was at Martin Field in Lowell two years ago when Amesbury lost to the Spartans, 8-5, in the D3 North finals. On that afternoon AHS went down 7-0 early but made things close at the end. This time around Collen Newbury will not be coaching St. Mary’s. Augie, Coach Waters’ dog, did not attend today’s game but his name came up between innings in the fifth inning.